My submit button works when PayPal is selected, but not when Chéque is selected. I followed your suggestions to the "T". Can you help me please? I'm not sure what you mean by I followed your suggestions to the "T", but I tried to clone and test your form and I did not find any problems with Chéque payment selected. Good eye! Your tech support is the greatest! I had the form height set in CSS on my page, so I just increased the size and VOILA! it worked! 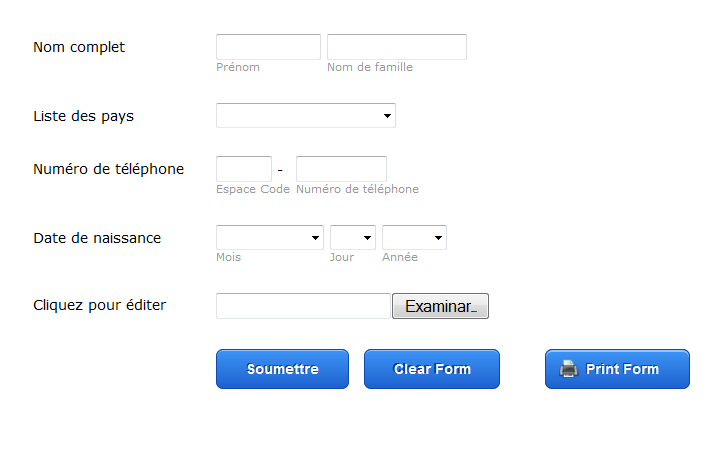 Speaking of "voila", you probably noticed that the form is in French. I need to know how to change two more things on this form. 2. The "Choose file" button text and the accompanying text "No file selected" to French. I'd also like to change the button color and style to match the submit button on the form... can I do that too? If so, how? It is great to know you solved the previous issue! In order to create forms in a different language, you must first select your preferred language before adding any form elements. 1st choose your preferred language at the bottom left part of the Form Builder page. In your case, first select French and then add , for example, the Birthday picker tool . Thanks for your response. However, you failed to respond to my question about the names of the months in French. 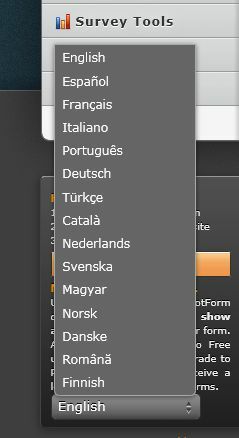 I DID create this form in French, but there are MANY places throughout the forms that do not have the translations in place, such as the names of the countries, the months, the upload button, the clear button, the print button and many of the warnings and such, so I need to know how to go in there and fix them all. And with the buttons, I chose the book blue2 theme. What would I put on ALL the buttons to have them consistent? And how do I change the text in the Clear Form button, the Upload button, Chose File button and it's accompanying text "no file chosen"? And of course, I'd like to have them all the same theme as the Submit button. My suggestion is to have ALL button choices be changed in a dialog box with button sample colors and language choice so that everything gets changed at once. Regarding to the style of the buttons, when you apply a theme for the submit button it will be also applied to the clear and print button. However, there might be a workaround , to accomplish the same for the upload button, because as you can see on the image above the upload button will take the properties of your OS installed on your computer (mine is Spanish and it shows "Examinar" on that button) . Hi Jeanette. Thank you for working on this for me. I really appreciate it. I already figured out the month thingy. But to go into Google and have to do a search and then past the country names into a list seems like a work around, not a solution. I have other sites to do forms on, one being Spanish, and a couple in Italian, and some more in French. Will I have to do this each time, along with various warning statements, thank yous and button texts? Do you see where I am going with this? In your eample above, do you notice that your Clear Form and Print Form are in English, and your Upload button is in Spanish? How do we change these? Like I said, my upload button is in Spanish because that is the Operating System of my computer (OS), as I have explained you, the upload button is a feature that belongs to the OS of your machine , in other words, it is called from the operating system by a function. That is why. Ok, I have come with a workaround for your form. Wow Jeanette! You must LOVE code! Well I injected this stuff right into my site's veins and... from my Mac on OS 10.7.4, I only see a "Choose File" button with text next to it saying "No file selected". Now that's in Safari. And Chrome. And OmniWeb. But in Firefox and Camino, I see only a "Browse..." button. None of these have your pretty new styling, sorry to say. I liked how that looked on your example! Are you on a PC? Now sorry to keep pestering you, but what about the text in the Clear Form and Print Form buttons? How do I change that? And when I choose PayPal and submit, there is a messaage that says "Processing..." here it come... how do I chagne that?!? If i am not mistaken, to change the texts of Clear Form and Print Form buttons you need to download your form's source code and make the necessary changes on it. Please check out the links below for more information. About your second question, i am not quiet sure if it can be done. But i will take a look at it. Meanwhile, i am sure that on of my colleagues will also come up with an idea. What my colleague AtacanC has advised to you is right. The only way to replace the words"print" and "clear form" by the ones into your language. is to download the source code . Regarding to paypal : do you mean , the message once you click on the "submit" button?